I had been putting this message at my msn messenger and friends had asked me why I do it. It is just my appreciation to the internet world. It had been my best friend for more than 8 years now.What will I be if there is no internet? 1. Maybe I had a PHD with a good career. 2. Maybe I got my own business. 3. Maybe I'm married with few kids. Lately, the internet had been a boring place for me. It become more boring when it had slow connection speed both at home and at the office. The IT guys at work had been filtering all the not needed sites. Maybe next few weeks, blogspot.com will be filtered too. 1. Thank You Internet for giving me more friends. 2. Thank You Internet for giving me more knowledge. 3. Thank You Internet for letting me having my own domains. 4. Thank You Internet for letting me chat at Yahoo & MSN messengers. 5. Thank You Internet for letting me downloading the videos, music and pictures. 6. 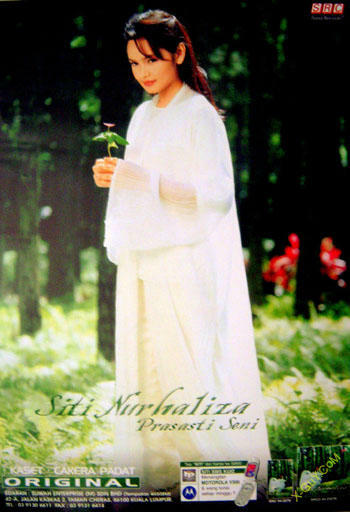 Thank You Internet for letting me surf Siti Nurhaliza Official Website where I get to know the real Siti Nurhaliza. 7. Thank You Internet for letting me surf CCS where i get to know Siti Nurhaliza's fabulous fans. 8. 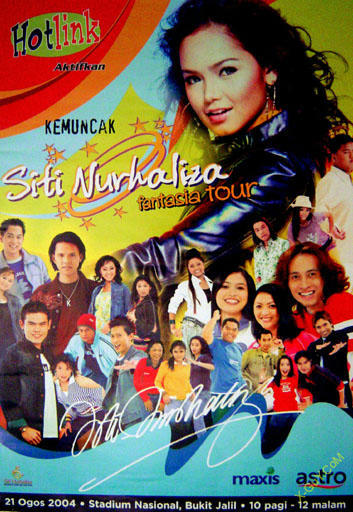 Thank You Internet for letting me surf SVOA where i get to know more Siti Nurhaliza's lovely fans. 9. Thank You Internet for letting me blog at X-GuY.CoM where people will know me better.Sometime you had to decide which path you need to take. The future depends on you. But it is ALLAH's decision about your future. Maybe I took a wrong path. There is no turning back now as the time is running fast. Just need to carry on with a hope (not high hope) of going to the right direction. Thank You Internet! Thank You All! At last, the VCDs were launched on 10th October 2005. The VCDs collection which was due 6 months ago, contained the concert performance (2 VCDs) and behind the scenes segment (1 VCD). The concert performance VCDs contained 2/3 of the full show. Fans who wanted to see the full show will have to wait for the release of the DVD version which will be announce later. For those who want to get a cheaper price (SGD15), do come down to CTea Booth at Geylang Serai tomorrow. As the seller said "Limited Stocks, 1st Come 1st Serve." He will be giving out posters too! GET THE ORIGINAL. STOP PIRACY! Nawaitu Suma Ghadin An Adaai Fardhi Syahri Ramadhaani Haatzihis Sanati lillahi Ta'ala. Saya niat puasa esok hari fardu Ramadhan di tahun ini hanya karena Allah taala. ÃƒËœÃ‚Â§Ãƒâ„¢Ã¢â‚¬Å¾Ãƒâ„¢Ã¢â‚¬Å¾Ãƒâ„¢Ã¢â‚¬ËœÃƒâ„¢Ã…Â½Ãƒâ„¢Ã¢â‚¬Â¡Ãƒâ„¢Ã‚?Ãƒâ„¢Ã¢â‚¬Â¦Ãƒâ„¢Ã¢â‚¬ËœÃƒâ„¢Ã…Â½ ÃƒËœÃ‚Â§Ãƒâ„¢Ã‚?Ãƒâ„¢Ã¢â‚¬Â Ãƒâ„¢Ã¢â‚¬ËœÃƒâ„¢Ã‚?Ãƒâ„¢Ã¢â‚¬Â° Ãƒâ„¢Ã¢â‚¬Å¾Ãƒâ„¢Ã…Â½Ãƒâ„¢Ã†â€™Ãƒâ„¢Ã…Â½ ÃƒËœÃ‚ÂµÃƒâ„¢Ã‚?Ãƒâ„¢Ã¢â‚¬Â¦Ãƒâ„¢Ã¢â‚¬â„¢ÃƒËœÃ‚ÂªÃƒâ„¢Ã‚? Ãƒâ„¢Ã‹â€ Ãƒâ„¢Ã…Â½ÃƒËœÃ‚Â¨Ãƒâ„¢Ã‚?Ãƒâ„¢Ã†â€™Ãƒâ„¢Ã…Â½ ÃƒËœÃ‚Â§Ãƒâ„¢Ã¢â‚¬Â¦Ãƒâ„¢Ã¢â‚¬Â Ãƒâ„¢Ã¢â‚¬â„¢ÃƒËœÃ‚ÂªÃƒâ„¢Ã‚? Ãƒâ„¢Ã‹â€ Ãƒâ„¢Ã…Â½ ÃƒËœÃ‚Â¹Ãƒâ„¢Ã…Â½Ãƒâ„¢Ã¢â‚¬Å¾Ãƒâ„¢Ã¢â‚¬Â° ÃƒËœÃ‚Â±Ãƒâ„¢Ã‚?ÃƒËœÃ‚Â²Ãƒâ„¢Ã¢â‚¬â„¢Ãƒâ„¢Ã¢â‚¬Å¡Ãƒâ„¢Ã‚?Ãƒâ„¢Ã†â€™Ãƒâ„¢Ã…Â½ ÃƒËœÃ‚Â§Ãƒâ„¢Ã…Â½Ãƒâ„¢Ã‚?Ãƒâ„¢Ã¢â‚¬â„¢ÃƒËœÃ‚Â·Ãƒâ„¢Ã…Â½ÃƒËœÃ‚Â±Ãƒâ„¢Ã¢â‚¬â„¢ÃƒËœÃ‚ÂªÃƒâ„¢Ã‚? ÃƒËœÃ‚Â°Ãƒâ„¢Ã…Â½Ãƒâ„¢Ã¢â‚¬Â¡Ãƒâ„¢Ã…Â½ÃƒËœÃ‚Â¨Ãƒâ„¢Ã…Â½ ÃƒËœÃ‚Â§Ãƒâ„¢Ã¢â‚¬Å¾ÃƒËœÃ‚Â¸Ãƒâ„¢Ã¢â‚¬ËœÃƒâ„¢Ã…Â½Ãƒâ„¢Ã¢â‚¬Â¦Ãƒâ„¢Ã…Â½ÃƒËœÃ‚Â£Ãƒâ„¢Ã‚? Ãƒâ„¢Ã‹â€ Ãƒâ„¢Ã…Â½ ÃƒËœÃ‚Â§ÃƒËœÃ‚Â¨Ãƒâ„¢Ã¢â‚¬â„¢ÃƒËœÃ‚ÂªÃƒâ„¢Ã…Â½Ãƒâ„¢Ã¢â‚¬Å¾Ãƒâ„¢Ã¢â‚¬ËœÃƒâ„¢Ã…Â½ÃƒËœÃ‚ÂªÃƒâ„¢Ã‚? ÃƒËœÃ‚Â§Ãƒâ„¢Ã¢â‚¬Å¾Ãƒâ„¢Ã¢â‚¬â„¢ÃƒËœÃ‚Â¹Ãƒâ„¢Ã‚?ÃƒËœÃ‚Â±Ãƒâ„¢Ã‚?Ãƒâ„¢Ã‹â€ Ãƒâ„¢Ã¢â‚¬Å¡Ãƒâ„¢Ã‚?ÃƒËœÃ…â€™ Ãƒâ„¢Ã‹â€ Ãƒâ„¢Ã…Â½ ÃƒËœÃ‚Â«Ãƒâ„¢Ã…Â½ÃƒËœÃ‚Â¨Ãƒâ„¢Ã…Â½ÃƒËœÃ‚ÂªÃƒâ„¢Ã…Â½ ÃƒËœÃ‚Â§Ãƒâ„¢Ã¢â‚¬Å¾ÃƒËœÃ‚Â£ÃƒËœÃ‚Â¬Ãƒâ„¢Ã¢â‚¬â„¢ÃƒËœÃ‚Â±Ãƒâ„¢Ã‚? ÃƒËœÃ‚Â¥Ãƒâ„¢Ã¢â‚¬Â Ãƒâ„¢Ã¢â‚¬â„¢ ÃƒËœÃ‚Â´Ãƒâ„¢Ã…Â½ÃƒËœÃ‚Â§ÃƒËœÃ‚Â¡Ãƒâ„¢Ã…Â½ ÃƒËœÃ‚Â§Ãƒâ„¢Ã¢â‚¬Å¾Ãƒâ„¢Ã¢â‚¬Å¾Ãƒâ„¢Ã¢â‚¬ËœÃƒâ„¢Ã…Â½Ãƒâ„¢Ã¢â‚¬Â¡Ãƒâ„¢Ã‚? First of all, I hope you like the new template. Sorry for the coding problem at the comment link. It's OK now. Do tag me.I haven't decide when to terminate my internet service. What would life be without internet? How should I spend my life? Go lepaking at town? Do save the pictures if you like as I do not have them with me anymore.I also like to share Siti Nurhaliza's video clips. But due to the difficulty to get a good server which allows the use of ftp, I can only shared them here. Maybe I create my own server in the future. 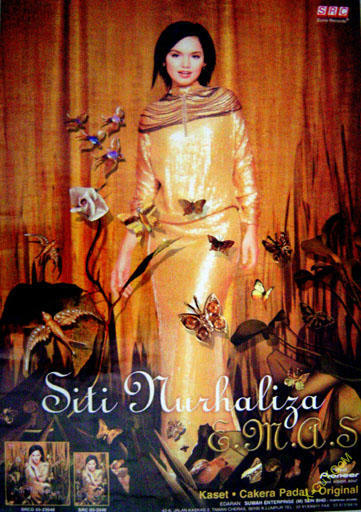 Oh… Lastly, I got some Siti Nurhaliza's old posters to give away. Anyone interested?